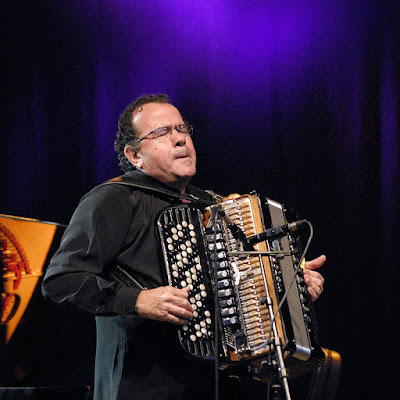 Richard Galliano, French accordion virtuoso, played a rare solo set to a full-ish and appreciative Wigmore Hall. He walked onto the stage, picked up his instrument, and started to play without a word, beginning with three of his own compositions. The first, which opened with the sound of the sea emerging from the bellows of his accordion, was a Nino Rota-esque tune called Habanerando. Galliano is an extraordinary player. At times he sounds as if he is a full tango quartet of instruments. He manages to conjure up strange soundscapes, like the sea sounds in his first piece, but also tinkling bells, bird song, a brass section, it is all rather miraculous. He then plunged into Le Fou-rire (crazy laughter), a bright, trilling piece with amazingly high notes, followed by Chat Pitre (cat-clown, also a pun on chapter), a much darker dance macabre-type lyrical melody, with suggestions of Eastern European folk harmonies. Galliano is a master of a wide variety of styles and he treated us to many of them. He is well known as an interpreter of the music of the great Argentinian composer and bandoneon maestro Astor Piazzolla, with whom he worked as a young man. It was Piazzolla who inspired him to reinvent the French popular music form Bal Musette, which in his hands became New Jazz Musette in the same way that Piazzolla himself had revisited Argentinian tango and come up with Nuevo Tango. He continued with an extraordinary Brazilian piece, Bebe by Hermeto Pascoal, which started with a James Bond theme-style set of dense chords from which melodic lines burst out, and which closed with bird sounds trilling out from Galliano’s right hand on the buttons and his left hand held aloft miming the flapping of birds wings. This was a recital rather than a gig. The audience was attentive, respectfully waiting for the last note of each tune to fade away before applauding rapturously. Galliano himself did not speak at all for the whole evening, but nodded to acknowledge the audience’s responses. Galliano produced an accordina for his next tune, a cool New York jazz take on My Funny Valentine. The first time I saw him perform was with his New York quartet featuring Gary Burton on vibes, and I saw him as purely a jazz musician. The next time I saw him was with his Septet playing exclusively the tango music of Piazzolla, and I learned how versatile he could be. By the time I heard him play the music of Nino Rota with Douglas, Surman, Penn, one of my favourite concerts ever, at the EFG London Jazz Festival in 2011, I realised he is completely uncategorisable and can turn his hands to any type of music Next came his most French piece, the bitter sweet Valse a Margaux, another of those compositions with a full, sonorous middle, a dark bass line, and a beautiful flickering melody, absolutely lovely. He finished the first set with Tango pour Claude, which I at first took for a Piazzolla melody, but is pure Galliano. He sounds like a complete tango quartet. The tune is an homage to Claude Nougaro, French chanson star, a generation older than Galliano, who died in 2004. Galliano arranged, played and conducted for him for many years. At the end of the first set, I was surprised to see that he had been playing for only 40 minutes, whereas we had been around the world and back, musically. The second set was just as delightful and varied as the first. He kicked off with a Michel Legrand homage which incorporated a couple of my favourites, Windmills of my Mind from the film The Thomas Crown Affair and the lovely Chanson de Maxence (known in English as You Must Believe in Spring) from what must surely be the most underrated musical of them all, Jacques Demy’s Les Demoiselles de Rochefort. He then slipped straight into a delicate reworking of Satie’s Gnossienne No.3, which finished on ethereal impossible high notes before fading away. We were ready for anything he chose to turn his hand to by this point, and he did not disappoint. He ripped into Odeon by Ernesto Nazareth, a staggeringly detailed and strutting rhythmic tune, and then a very baroque sounding Andaluz by Granados, with lovely vibrato on single notes almost like a guitar. He played two Piazzolla compositions, the beautiful Oblivion, with its achingly sad accompaniment but with such a proud beautiful melody over the top. At this point Galliano upped the ante and sounded like a whole tango quintet by himself. He slipped out of Oblivion with a little reference to Nino Rota, to thunderous applause. The rag/blues Mister Clifton, with its references to the Pink Panther and Straighten up and Fly Right zipped by, and suddenly Galliano was playing a Bach aria. He has recorded a whole album of Bach for Deutsche Grammophon. He is quoted as saying that playing Bach is: “Pour moi c'est l'aboutissement de quarante-cinq ans d'expérience musicale tout-terrain” (For me the culmination of 45 years of all-terrain/off-road musical experience). After the Bach, the final Piazzolla, an inspiring arrangement of Libertango, complete with scratchy percussive improvisation, at the end of which he received a standing ovation, and cries of “encore”. After acknowledging our applause, Galliano directed our gaze towards his accordion, like a conductor drawing our attention to the orchestra for us to applaud its part in the proceedings. He responded to requests for more with a delightful, New Jazz Musette version of that Charles Trenet classic, Que reste-il de nos amours? (I wish You Love), liquid bubbling melodic lines, jaunty, yet infused with melancholy. He even managed to stick in a reference to Night and Day. Perfect. What a privilege, in the charming, intimate, acoustically perfect venue which is the Wigmore Hall, to hear a virtuoso playing his “all-terrain” music.